One of the things John Green is incredibly good at is making me cry. Not in a personal way, although if I was to meet the incredible man himself I may cry tears of joy. 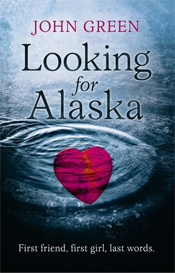 After reading The Fault in our Stars (see the review here, now known as TFIOS) I ended up discussing it with friends, one of which said to me ‘You have to read Looking for Alaska, you have to’ luckily he had a copy and lent it to me. I was hooked, as will you be. The novel opens with Miles , a character which I could connect with at first. I wasn’t sure of his quirks, remembering last words? What’s that about? It’s all part of Greens brilliance and something that I can’t reveal to you. I was slightly skeptical at first, Miles appeared to be a nerdy loner being shipped off to boarding school but for some reason I kept on reading. Before long we are introduced to Colonel and Alaska, a beautiful and complicated girl which often leaves Miles (now nicknamed ‘Pudge’) scratching his head. Once the other characters had been introduced I couldn’t put it down for my life. I was obsessed with the characters, Alaska in particular. I’d been forewarned that I was going to cry at some point in the book and so I thought I was safe, surely I wouldn’t cry like I did at TFIOS? A note to the girls reading, don’t read and wear makeup because you feel like you’re at school with Pudge, Colonel and Alaska. The chapters are a countdown which aids your curiosity but I mistakenly thought I knew what would happen. I was far from wrong. There are reasons why this novel is much more than just Young Adult fiction. Green has created another master piece which isn’t afraid to ask questions bigger than what you would believe. Themes of love, heartbreak, confusion, religion are all explored in a nonconventional way and you know what, Green doesn’t treat teenagers as idiots. The ideas that come alive both ‘before’ and ‘after’ will make you think for days, which as my readers will know in my eyes means it’s a fantastic book. It’s hard to believe that this was in fact Greens debut novel, with the great heights he is reaching with TFIOS, this is almost as good. I will give this book 4 and a half stars as it’s definitely going to be read and will stay on my shelf for a long time.